So, what is Form Filling work? Form filling work nothing but a simple and quick copy paste work, You need to Sing up into your member area and click on start work or put your mouse over new entry. Now you have two options one is some scanned PDF data (Work materials) and a new form to entry your data, now as per required form, you need to copy data from below scanned PDF Document and paste it to your Black fields. After getting confidence on your entries data you need to submit your work. That’s it, now your online jobs provider will review your work and prepare your payment into your register bank account. The story look quite simple but there is some scam make this awesome jobs little bit harder to us! Who can work in Form Filling work? Well it’s a Non-technical jobs, so if you have some kind of fear with IT and have small knowledge in computer then form filling work is for you. Basically Student, Housewife , retired person and any other non-technical online jobs seeker can choose form filling work as best choice from all other online jobs. 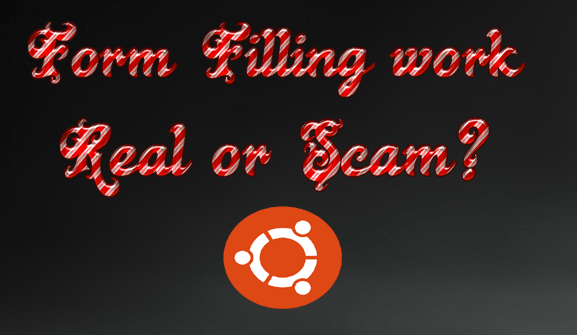 Is Form Filling work is a scam? The BIG QUESTION !! Nope, but there is so many website still present on internet by offering scam form filling work. The way you need to judge a website is offering a real or scam form filling work is too vital for your online career. We are not saying that all form filling jobs are scam, but still there is a lot of website are available India who offer real and handsome payment able form filling work. Try to Join those websites are listed on top of Google search on form filling jobs or online form filling jobs. Try to Search Free Joining Form filling jobs to avoid loss of registration fees. Try to call their customer care and use live chat support to make all of your inquiry. Ask as much as question you can. Remember before sing up you need to free your mind about how the work actually and how to do this in a smart way. Check for ISO certification and payment proof of existing member. How much I can earn by doing Form Filling jobs From Home? Your earing depends on your skill, computer knowledge and your confidence level. Let me say you are working for 8-10 houses in day and someone else doing the same jobs for 4-6 house in a day. May be other person can earn more money than you because of their better skills. Hence in short you can earn rs-5-12 on per single form entries by you. The time you are going to spend on a single entry is up to you. Many people earn Rs-5000 to Rs-8000 regularly by doing form filling jobs from home, now it’s your turn , let me know how you are mange to earn passive income and what would be your next plan move your online career to one steps up! Let me know in comment box! You are awesome !